It’s not everyday that a chef is invited to put on an apron and chef’s hat to take on one of the world’s most acclaimed chefs. For Alex Brugger, senior executive chef of the University of Houston System (UHS), it was an opportunity he couldn’t refuse. Brugger will dish up his culinary skills in an episode of “Beat Bobby Flay” on the Food Network, Thursday, Feb. 7 at 9 p.m. CST. It was Brugger’s friend, celebrity chef/ restauranteur Jet Tila, who convinced him to submit his resume to the Food Network. Tila, one of the hosts of “Iron Chef America,” visited UH last year as part of a celebrity chef series. 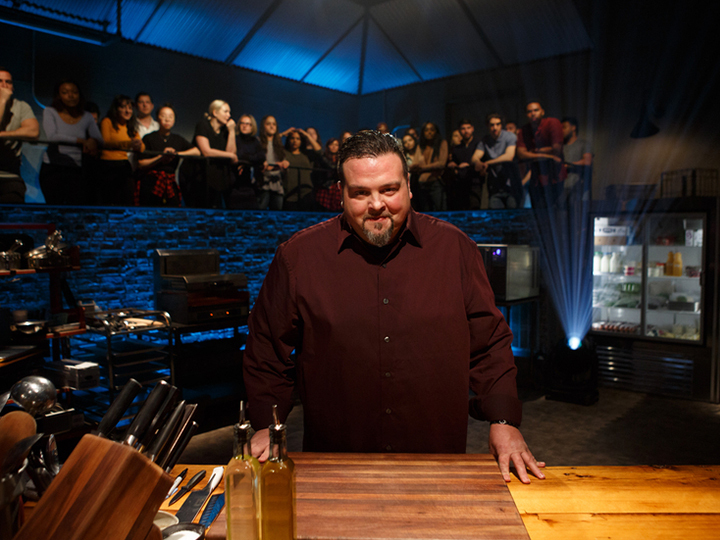 Brugger was quickly cast on “Beat Bobby Flay,” which pairs two chefs to face off against each other, creating a dish with a secret ingredient. The winning chef then gets to challenge Flay with a surprise signature dish. The episode was taped in June. When Chartwells Higher Education became the provider of dining services across the UH System in the summer of 2017, Brugger joined as senior executive chef. 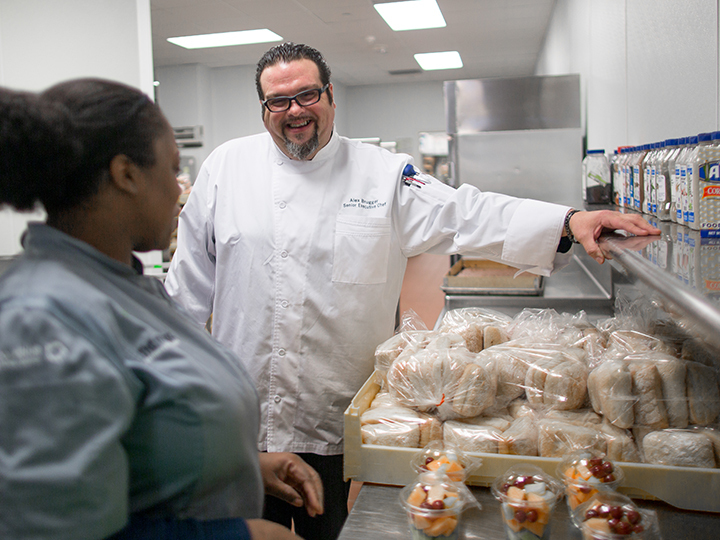 He manages the culinary and quality assurance programs with nearly 700 employees on a daily basis. Prior to UHS, he was the executive chef at Babson College in the Boston area. Chef Brugger recently spoke with us about his 30-year career in the industry. Q. Who inspired you to become a chef? A. My abuela (grandmother) Aida is responsible for me being here. As a child, I would go to her house after school and help her make Cuban classics like Arroz con Pollo, paella and flan, and I took a liking to it. She would have nothing but pride for me today. Q. Tell us about your journey through the dining world. A. My first job in the industry was at 16 as a dishwasher at a restaurant in my hometown of Miami. In that environment I not only learned how to cook, I also got exposure to the corporate side of the business. Things eventually took off and I worked my way up. I held executive titles at a young age in high-volume restaurants, including The Cheesecake Factory. I helped open BRIO Tuscan Grilles along the East Coast and owned restaurants. Q. You’ve served many VIP clients who include Chef Paul Bocuse – the “Father of French Cuisine,” owners and athletes of major sports teams, and corporate executives. How does that compare to serving tens of thousands of customers in a collegiate setting? A. One part I miss about being in a restaurant is putting individual attention to that perfect plate of food and seeing the guest’s reaction. In the collegiate world, I get to feed a thousand students at the same time. I love walking through the dining rooms, seeing the smiles on their faces. The students have an open line to me every day. If something is wrong, I want to hear about it and fix it. We stay in constant communication between the chat backs, our Dine on Campus mobile app and emails. Q. How have dining services at the UH System changed since you started? A. My motto is “If you wouldn’t serve it to your mother, don’t send it out to your guests.” The biggest impact we’ve made so far is the style, quality and consistency of the food. Moody Towers and Cougar Woods on the UH campus have become a showcase for clean, healthy eating and the guests appreciate it. We’ve also expanded the offerings at University of Houston-Downtown, and the next big project will be a retail dining program at University of Houston-Clear Lake. Q. What is your advice for future chefs or restauranteurs? A. My advice is to get used to and embrace failing. That is the ONLY thing that is going to harden you from what you will face in this business. Only when you have failed enough can you decide and choose your path. Then it involves a distinct decision to lead, follow or get out of the way. This business can be the most thankless and rewarding at the same time.